I’d like to thank you for following me on my journey. I know that 1,000 YouTube Subscribers is nothing to brag about compared to other youtubers, but the feeling of helping out people and receiving beautiful comments to encourage me to continue is really something that keeps me engaged and puts a smile on my face. I’ve got a month to post cause of some personal issues but… I will be back with more, longer and better tutorials soon! The more activity I see on my this blog and on my youtube channel, the more motivated I feel. 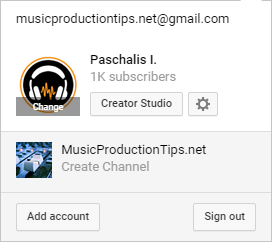 1k subs may be nothing compared to the home recording titans out there, but I promise that I will treat each subscriber with respect, being 1 or thousands. Thanks again for everything. Keep smiling and make music! Ask Us A Question – Join Our Community!